The first Impact Centre in Canada recognized for environmental stewardship excellence! At the Recycling Council of Alberta’s annual Rolling out the Recycling Red Carpet conference Thursday evening, Goodwill Industries of Alberta was awarded an Rs of Excellence Award for innovation and excellence in the operation of Canada’s first Impact Centre, a centre of excellence dedicated to recycling, sustainability and environmental stewardship. “Goodwill’s incredible Impact Centre won the Not for Profit Award based on their accomplishments of reducing and diverting waste”, said Christina Seidel, Executive Director Recycling Council of Alberta. “Goodwill is so proud to be awarded this very prestigious award for environmental stewardship and excellence in sustainability,” said Kevin MacDonald, Chair, Goodwill Board of Directors and a business consultant from Sherwood Park. 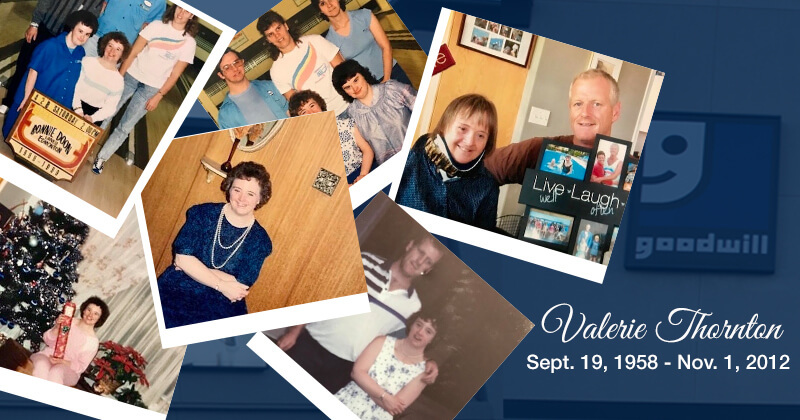 “For over 50 years, Goodwill has been an innovative leader in creating jobs for Albertans with disabilities through our social enterprise of thrift stores and our award winning career development and job creation program Pathways to Employment” explained MacDonald. 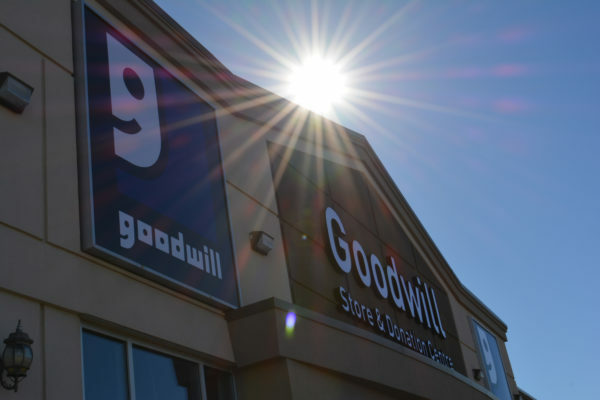 “Just over a year ago Goodwill opened the first Impact Centre in Canada, taking the best practices of Goodwills from across North America and emerging such an innovative facility in northwest Edmonton. Under one roof spanning 100,000 sq. feet, Goodwill is emerging exciting new frontiers in recycling and repurposing on our drive to zero waste accreditation,” indicated Jodi Tomchyshyn London, a recent addition to Goodwill’s Board and a thought leader and business consultant in sustainability based in Calgary. “Our Impact Centre is truly a special operation dedicated to innovation in recycling and sustainability creating unprecedented opportunity for our mission of providing career development and job creation for Albertans with disabilities. When generous people donate used household goods and clothing to Goodwill, they are part of something very special, very beneficial and very impactful; today at the Recycling Council of Alberta annual awards, Goodwill was celebrated for ensuring the approximate 10,000,000 articles of clothing and used household goods not only are invested into job and career opportunity for Albertans with disabilities, the use and stewardship of these donations are processed and optimized through an award winning enterprise leading the way in sustainability” beamed Tomchyshyn London. 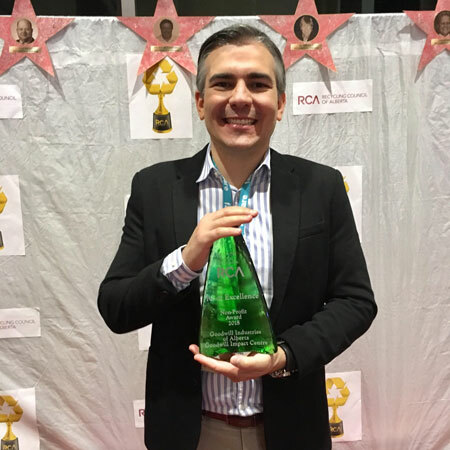 “This award and many innovations we have been able to emerge throughout 2018 would not have been possible without the support of the Alberta Treasury Branch. Goodwill partnered with ATB a year ago to advance our social enterprise to all new heights of success and contribution to the community as Goodwill changes lives for the better, strengthens families and communities through the power of work and the dignity of a job”, offers Dale Monaghan, President and CEO of Goodwill. “ATB supported the launch of Goodwill’s Sustainability Action Plan and today Goodwill team members across Alberta feel such a sense of achievement as we are not only recognized a leader in job creation for Albertans with disabilities, we are now recognized for our tremendous success in recycling and sustainability! We are so proud to win this prestigious award, and we are so proud and appreciative of ATB’s belief in Goodwill,” concluded Monaghan. The Recycling Council of Alberta’s mission is to promote and facilitate waste reduction, recycling, and resource conservation in the Province of Alberta. Through a consultative approach and support of the Recycling Council of Alberta’s Committees and partners (government, industry, stewardship organizations and other associations) and additional stakeholders, the Recycling Council of Alberta will pursue protection of the environment through resource conservation following the 3Rs hierarchy. Goodwill Industries of Alberta is a nonprofit social enterprise providing individuals with disabilities the opportunity to enhance their lives through meaningful employment. 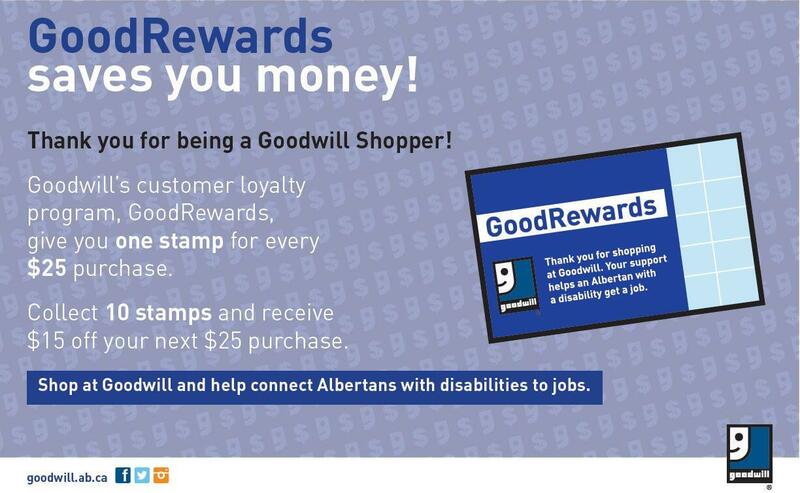 Goodwill is one of Alberta’s largest employers of people with disabilities. 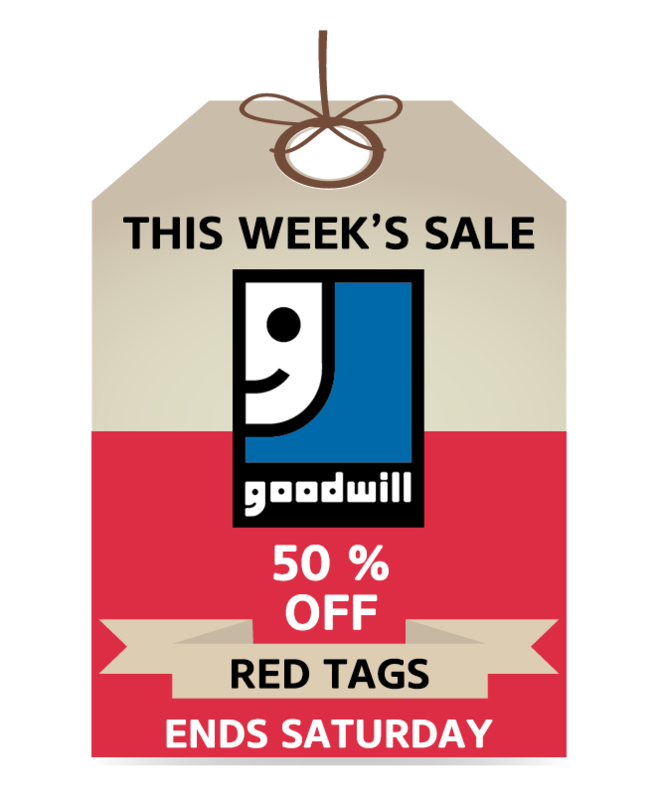 Currently Goodwill employs approximately 800 team members. Through nearly 10,000,000 articles of clothing and used household goods donated by caring Albertans, Goodwill operates thrift stores across Alberta generating revenue for Goodwill’s career development services and job creation. In 2017 Goodwill diverted 12,358,567 kgs of material from Alberta landfills including recycling 466 tonnes of mixed paper, 168 tonnes of metal and 283 tonnes of electronics. Goodwill opened its first thrift store in Alberta (in Edmonton) in 1963.